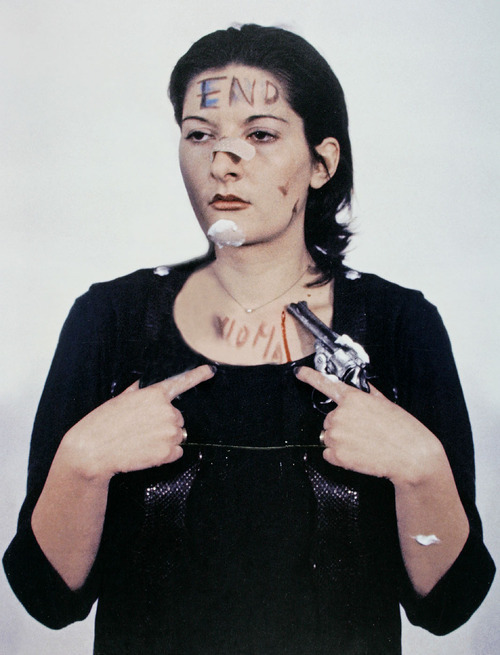 Marina Abramović is acclaimed as one of the most hypnotic performer working in the fine art area. Far from being classified as just a feminist, definitely she made a great impact on the representation of gender and sexuality in Western culture. Aged 70, she has been exploring human sensibility and emotions for over 40 years and using her inner body as the subject, object and medium towards the audiences. Back in the Seventies, one could mention one of her initial solo exhibitions such as “Rhythm 0″ where, during a six hours long performance, she decided to explore the human body’s endurance by pushing its limits as far as people wanted (by risking her own life). Between Seventies and the Eighties we could talk about her 12 years long relationship with Ulay, which has been transformed in the longer living love performance ever made. Together the artists have been investigating on human feelings and their immateriality, as well as highlighting the power of total trust or the physical effects of time on relations. Nonetheless when the love story ended after walking the Great Wall of China, she started feeling ugly and unwanted, so as that for Marina it started emerging the need of expressing herself and busting her confidence not only as an artist, but as a woman. Something was changing. If before the Seventies being an artist would mean to abandon any ephemeral expression related to personal appearance, overtime her interest in fashion did actually work as a therapy against depression. “It’s total vanity” the artist said during an interview for Art21. During the Eighties when entering the Yohji Yamamoto boutique in Paris and wearing up simple trousers, a jacket and an asymmetric white shirt made her feeling different and self-confident again. Ever since 2010, the beginning of several collaborations with international brands and designers helped her accentuate not only her visibility as a performer, but also celebrating the increasing syntony between art and fashion. Thereafter on the occasion of Fifa World Cup 2014, the brand Adidas launched “Work Relation” (the 1978 performance remake) that centers on the relevance of teamwork as an essential tool for maximizing commitments. With no doubt the creative match has produced more than provoking sensations. As a matter of facts in 2016 Marina undertook the art direction of Givenchy together with Riccardo Tisci, and the duo has been working on the communication the sacred of dialogue among different cultures while honoring peace during a commemorative day such as it is the 9/11. Thus if on the one hand Marina has gradually been welcomed by the Fashion system and transformed in a sort of godmother, on the other hand she is one of those artists who made the alignment of clothing and art industries possible. Posted on June 28, 2017 October 18, 2017 by antoniaspagnardi	This entry was posted in tales and tagged adidas, art, fashion, fine arts, givenchy, marina abramovic, performance, riccardo tisci. Bookmark the permalink.